SANDUSKY, Ohio (January 5, 2018) – Returning to Tulsa, Oklahoma, for his 23rd time, Tracy Hines heads to this year’s 32nd Annual Lucas Oil Chili Bowl Nationals Presented by General Tire in search of another Golden Driller trophy with Ride Television Network, Inc. by his side. Hines, ThorSport Racing’s Competition Director, and RIDE TV, a valued partner with the NASCAR Camping World Truck Series team, looks to repeat the USAC Triple Crown and Chili Bowl champion’s win from 2005. RIDE TV, the first high definition American cable television network and website dedicated to horse culture and lifestyle, features shows such as “Swamp Donkey,” “Rock Star Vets,” “Southern Fried Skinnyfied,” along with several others. Formed in 2012 and based in Fort Worth, Texas, RIDE TV is carried by many major television communications companies including Dish Network, across North America and internationally. With RIDE TV adorning the side of his No. 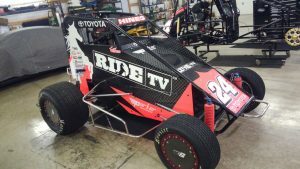 24 RIDE TV Toyota Spike midget, the New Castle, Indiana, native will first take to the track for practice Monday, January 8, before competing in the VIROC Race of Champions Tuesday, and qualifying Thursday at the River Spirit Expo during the John Christner Trucking Qualifying Night. The 32nd Annual Lucas Oil Chili Bowl Nationals Presented by General Tire kicks off Tuesday in Tulsa, available on pay-per-view throughout the week leading up to Saturday’s main event, with MAVTV broadcasting live starting at 8:30 p.m. ET Saturday, Jan. 13. Ride Television Network, Inc. is a privately held corporation based in Fort Worth, Texas. The company was formed in 2011 for the purpose of launching a 24-hour, high definition, television network. RIDE TV launched Oct. 1, 2014, in the United States and is now available internationally. The network features high-quality television programming showcasing both English and Western disciplines and lifestyles and includes live events, reality shows, talk shows, children’s programming, documentaries and more. For more information about RIDE TV, please visit www.ridetv.com.